I have a mixed marriage in the sense that I am and have long been a PC guy and my wife is a dedicated Mac user and has been since before we were married. I’ve certainly used my share of Macs—you don’t work in publishing without spending time on a Mac, or at least you didn’t years ago—but my original connection to computers was gaming, and that was all about the PC. Because of this, I was never really that interested in the Steve Jobs cult of personality. My wife and kids all have iPhones; I have a Galaxy. Steve Jobs is a pseudo biography of Jobs. It’s more a trio of memoirs, seeing Jobs in the moments before three product launches: the Macintosh, the NeXT, and the iMac. What this isn’t is a nice picture of Jobs as a person. While this may not be a “warts-and-all” biography, it is one where at least some of the warts are not merely included, but are featured. These include his tremendous ego and his evident need for complete control over everything he touched. The film doesn’t really explore the technology or the innovation; instead, it explores a set of relationships that Jobs had over the course of his career. The first launch is for the Macintosh, and happens just after the groundbreaking Super Bowl commercial in 1984. 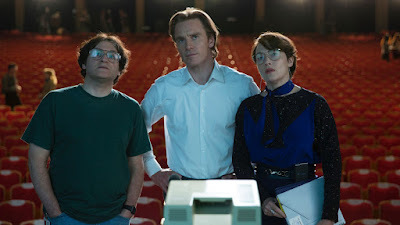 As Steve Jobs (Michael Fassbender) is preparing to go on stage to introduce the Mac, he learns that the voice feature is not working. Desperate to have the computer simply say, “Hello,” he threatens Mac team member Andy Hertzfeld (Michael Stuhlbarg) with his job if he can’t get the demo to work. Jobs is also livid over the fact that Time Magazine has printed a story of a paternity dispute with ex-girlfriend Chrisann Brennan (Katherine Waterston) and her daughter Lisa (Makenzie Moss, then Ripley Sobo, and finally Perla Haney-Jardine). The only thing that seems to be keeping Jobs in line is Apple marketing executive Joanna Hoffmann (Kate Winslet). Through all of this, Jobs is dealing with Apple co-founder Steve Wozniak (Seth Rogen), who wants a simple acknowledgment of the Apple II team, something Jobs refuses. Four years later, Jobs has been ousted from Apple and is starting NeXT, a new company. His ouster happened because of the general failure of the Mac line in terms of consumers. More confrontations happen here. Again, Chrisann fights over money and child support, and problem seem to plague this launch as well. Specifically, the NeXT, while being announced, is woefully incomplete, not even having an operating system. Steve Wozniak comes to attempt to make amends, as does Apple CEO John Sculley (Jeff Daniels), who is generally thought of as the man who ousted Jobs from Apple in the first place. It soon becomes evident that Jobs has designed the NeXT and delayed the OS because Apple has lost so much market share and is so desperate for direction that Jobs believes the company will be forced to buy NeXT and reinstate him. The third sequence happens with Jobs back at Apple and John Sculley ousted as CEO in 1998. Once again, the old players have returned. The confrontation with Wozniak is much more public this time and much nastier on both sides, but the meeting with Sculley is much more pleasant and forgiving. Lisa, now 19, confronts Jobs about his refusing to pay her college tuition and it having to be paid instead by Andy Hertzfeld. Throughout, there are flashbacks to various earlier moments in Steve Jobs’s career including early arguments with Wozniak about the architecture of the Apple and the confrontation with the Apple board that led to his ouster. In all of these conversations as well as all of the incidents before each of the product launches, Jobs is depicted as a man absolutely obsessed with control over every aspect of what he does. If true (and movies like this become truth whether they are or not), it explains a great deal of the philosophy behind Macintosh and the iWhatever line. Jobs wanted everything proprietary, locked in, and without giving the customer the ability to augment, upgrade, or personalize the machine. Michael Fassbender is brilliant in the role, especially in the sense that for the bulk of this movie, Jobs is portrayed as an egotistical control freak. He seems incapable of any real affection for anything or possessed of much ability to acknowledge that other people have good or interesting ideas. In fact, his only real, healthy relationship seems to be with Joanna Hoffmann, who also seems to be the only person willing to stand up to Jobs or get him to do anything he doesn’t want to do. While there is an attempt at humanizing him by the end of the film, this is a film that very much wants to depict someone who is a genius in some respects, and incapable of normal human connection in many others. While Fassbender’s Jobs is the focus of the film, it is Kate Winslet’s Hoffmann who is the heart and soul of the film. She acts more or less as his conscience and Winslet is absolutely committed to the role. The film is also extremely kind to Steve Wozniak, who comes across as someone who genuinely wants respect and some acknowledgment that he does not think he’s ever gotten. Seth Rogen seems like an odd choice for the role, but as is often the case with comedians, handling a dramatic role comes naturally after the more rigorous demands of comedy. Steve Jobs is a good film, but not a great one. I am a little surprised at the lack of nomination for the screenplay, written by Aaron Sorkin. As with many of Sorkin’s works, the screenplay is filled with great lines, the sort of lines that sound wonderful but that, ultimately aren’t the way real people actually talk. This is a one-off film for me. I think it’s worth seeing, if only to attack the cult mentality of many an Apple fan, but since I was never an Apple fan, it might be less important for me to see it. As a final note, it’s staggering to me how much Fassbender looks like Ed Harris circa The Truman Show in the final third of the film. Why to watch Steve Jobs: Genius of any sort is interesting. Why not to watch: If you’re a Jobs fan, you might not be by the end. I had no dog in this contest, a computer is a computer is a computer to me. I turn it on, it works, I'm happy and could care less than zero who made it, what other kinds there are or any fancy tricks it can do. I'm a utilitarian user only vaguely familiar with the names of the people involved so I suppose I was able to watch this dispassionately, all I knew about Jobs was his computer success and his health struggles. That said I walked away with a low opinion of Jobs as a person but his focus and ambition were obviously a mighty force and Fassbender did a fine job of making that a tangible reality. But I was most impressed with Kate Winslet's work portraying a person with an incredibly tough skin who still managed to maintain both her humanity and equilibrium in what must have been a pressure cooker existence. I went into this not a true believer, but having been married to a true Apple lover for more than a couple of decades. Just how miserable a person Jobs seemed to be was eye-opening for me. Kate Winslet is pretty great in this.